Spc. Erin Raymond, of Saint Robert, shows her “war face” after she and Spc. Hank Schmitz, both of the 35th Engineer Brigade, secure a hallway during a building clearing exercise Sunday during weekend drill at Fort Leonard Wood. FORT LEONARD WOOD, Mo. (Nov. 9, 2009) — Even for a combat medic like Spc. Erin Raymond, knowing how to clear a room is a fundamental soldier task. “Also, if by chance I ever need to go into a building to get a casualty out or provide care, I have to know the proper way to do it without getting myself or any of my other team members injured,” Raymond said. Raymond joined members of her new unit, the Missouri National Guard’s Headquarters and Headquarters Company in the 35th Engineer Brigade of Fort Leonard Wood, for some military operations on urbanized terrain training during monthly drill. The soldiers went through a walk and crawl phase where they re-familiarized themselves with tactics, techniques and procedures and performed their tasks without Kevlar helmets or individual body armor. No ammunition, including blanks, was used, nor were there any types of pyrotechnic booby traps or improvised explosive devices in place. The slower pace also allowed soldiers the opportunity to ask questions and learn from their mistakes. Soldiers were divided up into four new squads to go through the tasks. Doty said what impressed him most about the training was how well the soldiers, who had never worked together in these squads, performed. For Spc. Hank Schmitz, of Waynesville, the training was a good experience because he learned different methods of accomplishing the same task. Doty also was pleased that the soldiers were able to complete the training and did so without any injuries. 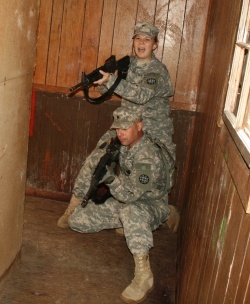 Overall, the soldiers responded well to the training. “It was a good refresher for me on clearing buildings. It was very good training and I learned a lot,” Raymond said. Schmitz said the most crucial thing he learned was the speed needed to clear a building effectively. Staff Sgt. Lavern Peart, of Waynesville, said she re-learned a lot because it was training she hadn’t received in a while. Spc. Rico Jenkins, of Jefferson City, said the two important things he learned during the training were troop spacing and how to communicate in that type of combat situation. Jenkins called it valuable training because the enemy isn’t just going to walk out of a structure and give up. During drill, the unit recognized specific soldiers for their recent accomplishments. • Command Sgt. Maj. Ray Harding, of St. Robert, had his retirement ceremony after 37 years of service in the National Guard, 35 of which were in Missouri. • Maj. Joe Coyle, of Ballwin, was awarded a Bronze Star. • David Eley, of Springfield, was promoted from the rank of private first class to specialist. • Pfc. Brian Kaolowi, of St. Robert, was recognized as the brigade’s Soldier of the Quarter. • Sgt. Juanita Yabarra, of Laquey, was honored by the unit after her term of service expired. She received a saber from the unit’s noncommissioned officers, as well as an Army Commendation Medal.